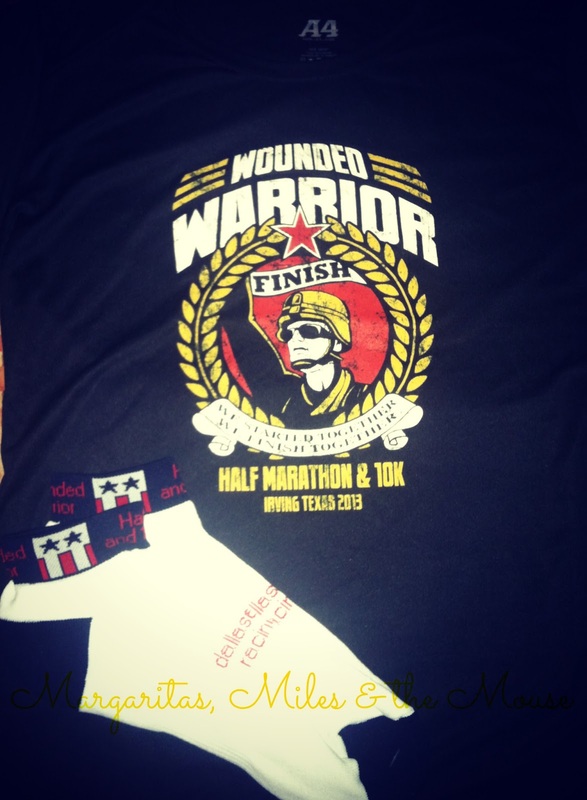 Home » 2013 Wounded Warrior 10K Recap- Shenangians Got Wet! 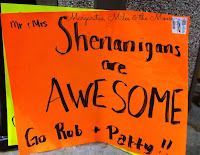 2013 Wounded Warrior 10K Recap- Shenangians Got Wet! I’ll just come out and say it. I don’t run in the rain. I don’t run in the cold. I don’t run in the heat. I don’t run when it’s too sunny. I don’t run when the humidity is awful. I’m a little like Goldilocks, you know? There’s a long list of conditions that Shenanigans finds acceptable for running —- and this ain’t it. That’s what we had going on right before the run last Sunday. It came on fast and furious with an amazing lightening show to boot! I hoped thought this race was going to be called. Mr. Shenanigans was strangely giddy about it all- being former Army I guess a little rain wasn’t going to stop him from running this one! We waited it out and the 7am start ended up being an 8:30am start. The most awesome part of this race- my friend Jaime showed up to cheer us on! With signs! They got trashed due to the weather- but she took a picture for us to remember. At the start, it was still raining, and I was still apprehensive. It’s not that I think I’ll melt or anything, but that I worry about footing. I have this irrational fear of falling during a race, breaking an ankle, and not being able to go back to Disney race again. So I just don’t go when it’s wet out. True Story. Met Laura again at the start of the race- a nice surprise! She was supposed to run with her group, but they cancelled their run (duh) so she decided to sign up for this one with me. Man, she’s the best. Seriously. While I whined a lot about the rain and the circumstances, I can only IMAGINE what level of complaining I would have been at if we did NOT have this rain to cool us off. The weather was supposed to be 77 at the start with 92% humidity. Um. No. Just. No. That would have been over 85 by the time we finished running. Really ugly, y’all. Lesson I’ve learned from this race: rain can be a really, really, good thing! We ended up wet, but at 68 degrees with a slight breeze the whole way (and a lot of RunGuard applied in advance)— yeah, I’ll take it and shut up now. YAY for RAIN! The course itself was great. Very flat, nothing too challenging at all. Except for this part. The crazy thing is the half marathoners actually DID run through this! One of my Facebook groups are the Half Fanatics, and they had pictures. The course was an out and back and by the time they were coming back, it was “only” ankle deep… and they slogged through it. YIKES! I felt blah- my legs were not going this day. It wasn’t the worst run I’ve had, but it certainly was not the goal run I had in mind. I just wanted to get it done. Mile 5 had Mr. 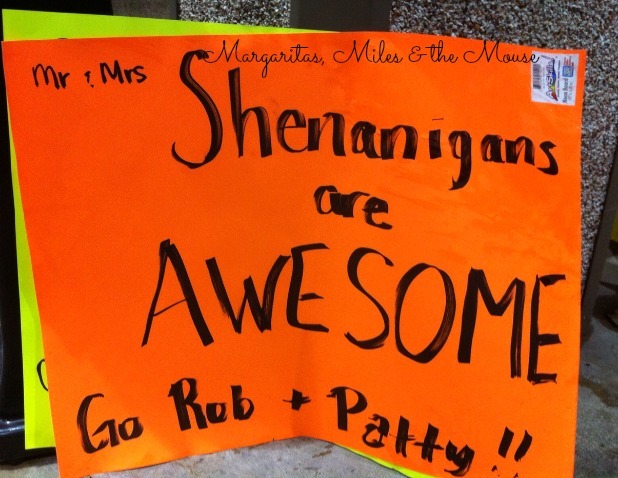 Shenanigans run ahead with our blessing. Laura was pulling me through yet another race and promised to get me to the end. It was “only” a 10K but I was just not mentally into this one at all. I haven’t gotten to that point where I can shut out the voices in my head and just run. They keep talking to me. All the time- telling me things I don’t really believe or want to hear, but at that moment of weakness I give in. So I walked a lot. Way more than I do in my training runs. I cannot give an answer as to why I defeated myself like this, but there ya go. I’m a work in progress- what can I say? We (finally) finished! And I loved the finish area of this race. They had music, Marines, and food… all good things! Wasn’t sure what to do with my hands. Can you hug a Marine? He ran with the gas mask on the whole way. Wow. Sigh. I need to remember #FirstWorldProblems and move on sometimes. I’m extremely blessed in so many ways: the shirt is really, completely, totally insignificant.